Don't wait until the airport to change New Zealand dollars into foreign currency, - the rates and fees are awful. A little planning could save hundreds of dollars. Beware of fees, commissions, bad exchange rates and other tricks when using currency exchange kiosks in New Zealand and overseas. Most banks consistently offer very similar exchange rates at any one time, but not all will have sufficient currency in stock. ​The right credit cards consistently provide the cheapest way to spend abroad, specifically Kiwibank's offering. Always pay in the local currency when using a card - this avoids 'Dynamic Currency Conversion' which can sting you at overseas ATMs and merchants who offer lousy conversions to the New Zealand dollar. Both the ASB and Kiwibank will buy back foreign currency at reasonable exchange rates without a fee. We've put this guide together because a competitive exchange rate will help you get more travel money to take with you overseas. 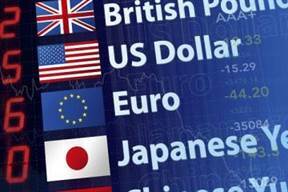 ​Where to Buy Foreign Currency? It is the currency you use to pay for things abroad, instead of New Zealand dollars. For example, in Australia, the foreign currency you would use is Australian dollars, and in most of Europe, it would be the Euro. What foreign currency you need depends on where you are travelling to. You can buy foreign currency before you leave New Zealand at money changers and banks. An exchange rate tells you how much foreign currency you can get in exchange for your existing currency. For example, if the New Zealand dollar to Australian dollar exchange rate was 0.90, you would get 0.90 Australian dollars (or 90 cents) for every New Zealand dollar you exchanged. You will often see this written as NZD/AUD or NZD:AUD. Which exchange rate is better? The higher the exchange rate, the better. For example, 0.92 is a better exchange rate than 0.89. 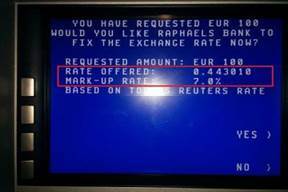 Why are exchange rates different between banks? Like all banking products, banks charge different fees. 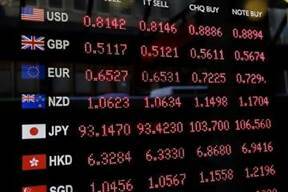 Exchange rates are no different - for example, you may see NZD:AUD at 0.90 advertised at one bank, and 0.91 at another. You'll need to consider the transaction fee as well, usually a fixed $5 or $10, to get the most foreign currency for your New Zealand dollars. How much foreign currency you need depends on how long you are visiting, what you plan to do and what things cost. Set a travel budget on how much you want to spend, and add an extra amount per day to cover emergencies. Accommodation: Some hotels can be reserved online with the requirement to pay cash at check-out, whereas Airbnb and holiday rentals take card payment at the time of booking. Eating and drinking out: snacks, breakfast, lunch, dinner, coffees. Experiences: tickets to events, tourist attractions. Transport: Airport bus and taxis. ​Where can you buy foreign currency? 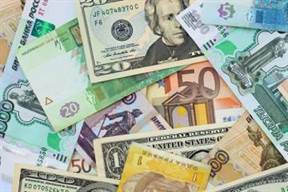 At a Bank - Most banks offer a foreign currency exchange service, but each branch may be limited in what it has in stock. For example, few banks will stock Japanese Yen or Canadian Dollars despite advertising it. 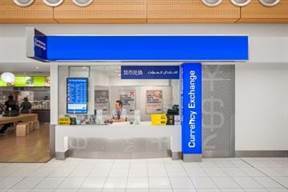 Bureau de change (Auckland, Wellington and Christchurch CBDs and at international airports) - In the main streets and malls of larger cities and international airports (inside and outside of New Zealand) you can find foreign currency exchange booths offering to convert your NZ dollars to a foreign currency. Online with delivery or collection - a growing number of foreign currency providers have opened up online - customers order the currency they need and pick it up from their closest location or have it delivered by courier for a fee. Overseas - You can withdraw money using your debit card or credit card at a foreign ATM (we explain the fees below). Using a travel money card - many banks and travel companies offer prepaid travel money cards - these let you make payments and withdraw cash overseas (just like an EFTPOS card would in New Zealand) as you top up the card with NZ dollars. Interbank rate: The exchange rate that banks use between themselves - this is a 'wholesale' rate and always better than what you will be offered, but indicates how much the New Zealand dollar is worth against a particular currency. Commission: The fee charged by the foreign currency provider as a percentage of the total value of the foreign currency you are buying for the service of converting your money into a foreign currency. For example, if the commission is 5%, you'll pay 5% of the total value of your purchase in commission. Transaction fee: This is a fee for buying the currency from the provider. What is the best way to spend overseas? Unless you know the tricks of foreign currency, spending money overseas can end up costing a small fortune in fees. Every trip is different - knowing the best options saves you money, time and hassle. 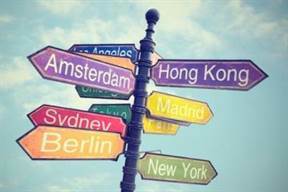 ​How can you spend overseas? Cash: Fly over with foreign currency, but make sure to budget your time away correctly to avoid running out of money. Finding the best forex deal before taking off is essential to save money. Credit card or debit card: Using a credit card or debit card abroad is popular, but transaction fees apply for each purchase and withdrawing money from an ATM incurs interest on a credit card. Prepaid travel money card: These popular cards are flexible; you can load the card via internet banking and use it in shops or withdraw it as cash from ATMs. Travellers Cheques: Travellers cheques are largely outdated, increasingly difficult to change overseas and widely unpopular. We do not cover travellers cheques any further in this guide. Hands down, this is the easiest way to start spending when you get to your destination. Easy to manage - spend what you need, know what's left etc. If you bring New Zealand dollars, there is no guarantee of getting a good rate, and some locations may not accept them. Most debit and credit cards charge you for every transaction you make overseas, but fees do vary between banks (as outlined in the table below) and the best card (Kiwibank's credit card) can cut the cost of your spending overseas. Travel Money cards are popular among New Zealanders overseas, offering the benefits of low fees, fixed exchange rates and multiple currencies. Your spending money is prepaid, and you don't need to carry around envelopes of foreign currency when you head off overseas. Travel Money cards are safer than cash, and if you lose it, a phone call to the issuer will block it instantly. Travel Money cards act like having digital currency in your wallet. For example, you buy 500 Euros, 500 British Pounds, 500 US Dollars. To spend the balance, you use the card when in the countries that use those currencies and the balance is deducted. If you run out of any currency, you can use internet banking and top up. Your New Zealand dollars will be converted to the currency using the exchange rate at the time of your transaction. Travel Money cards help you budget - you also can't overspend using them (although a credit card is a good backup in case of an emergency). When you load a card with New Zealand dollars, it buys the currency of your choice at a fixed exchange rate. This means if the NZD drops, your purchased currency is locked in and protected so you have certainty over how much you'll have for your trip. Travel Money cards don't need credit checks, so anyone of any age can apply for one. Some Travel Money cards offer reward points. ​The fees - including setup fees ($0 to $20), delivery fees (up to $50), ATM cash withdrawal fees ($2 to $6) and others. 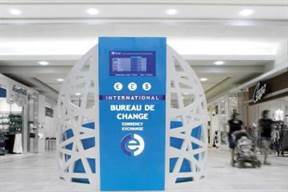 Airports currency exchange kiosks have the worst rates on earth, mostly relying on traveller panic about not having any travel money - this Australian article explains the problem. If you have to get your travel money at the airport be careful - you will likely pay much more than withdrawing the same amount overseas on a debit card even if fees are included. "I bought Australian dollars from a forex kiosk in Little Collins Street, Melbourne. The rate was 0.90 NZD to AUD. I asked how much for AUD 500 and was quoted NZD 600. This seemed high, but I said OK while getting my phone to do the conversion. After I got the money I saw the receipt - there had been a 7% 'commission fee' and charged and a $5 'transaction fee'. I argued and asked for my money back, realising I'd been fleeced $40 with the huge commission. The guy at the kiosk never mentioned the 7% fee and $5 fee, but he argued back that I had accepted the rate when I said 'OK' to the $600 quote. 7% is a MAJOR rip-off, especially when my debit card charges 2.50% if I take money out overseas". The 'buy' exchange rate - many outfits show two numbers, the buy and the sell. When you see something like NZD:AUD 0.92 (Buy) and 0.95 (Sell), this means you will get the 0.92 rate as you are buying Australian dollars. The 0.95 (Sell) rate only applies if you are buying New Zealand dollars with Australian dollars, meaning you would need 0.95 AUD to buy 1 NZD. The transaction fee - many banks and forex outfits locally charge as much as $10 per currency no matter how much you are buying; overseas it can be higher. Always calculate what you should pay BEFORE accepting the transaction; read the Pro tips (below) for more details. Know the exchange rate before - use XE and download the app so you know what the exchange rate should be before you approach a forex seller. Ask if the seller has enough of the currency you wish to buy first - sometimes they won't. Ask whether there is any commission, and what percentage it is. Don't be afraid to negotiate. ​You probably can't get a deal on the rate, but transaction fees and commissions are always negotiable. It's best to ask to drop the commission first, and then work on the fee. The higher the value of your transaction, the more ability there is to negotiate. If you go ahead, specify the notes you want. Don't be stuck with big notes - go for a mix of 'smalls' and 'bigs' if that suits you more. If you are going somewhere exotic and can't find the currency you want within New Zealand, consider taking Euros or US Dollars. If you want to have cash in your wallet for emergencies and as a general safety net, Euros are best if you're going to be in Europe (but not in a Euro country) and US Dollars are accepted anywhere else in the world. The US Dollar is the world's most convertible currency and having a few stashed away is a popular way to avoid being stuck with no money if your debit or credit card doesn't work or goes missing. Many forex providers advertise ‘0% commission’, ‘best forex rates’ or ‘guaranteed best rates’ to make people trust them. We believe such claims are often misleading. For example, '0% commission' may be true but the exchange rates offered can be worse than other providers, or there may be a transaction fee lurking around. Be alert and don't be fooled by what you read. Foreign ATMs and card machines often say nice-sounding things like: “Would you like to fix the exchange rate in New Zealand Dollars?” or "This ATM offers conversion to New Zealand Dollars". In some cases, you're not even asked - you'll just see an exchange rate, a familiar looking amount in NZD and the options of “Yes” or “No”. This looks friendly and convenient, and there is a benefit of knowing what you will be charged in NZD for whatever you are buying or withdrawing. But, in reality, paying in NZD – or even just accidentally pressing “Yes” to a rate – is a hidden fee horror. 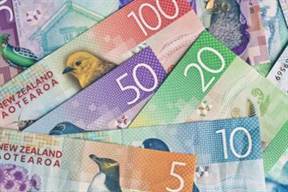 DON'T ACCEPT a "fixed" or "New Zealand Dollar" exchange rate that appears on the screen. Ever. This scheme is a service known as Dynamic Currency Conversion. It effectively means you are accepting an exchange offered by the machine. And it is always, always a bad one, adding up to 7% on to the cost of your transaction. But it is not clear at all - the wording is confusing and what the machine is saying may lead you into pressing the wrong button. The examples below illustrate this - pressing "Yes" at the ATM means you'll be charged 7% (bad), while pressing "Enter" in the EFTPOS machine means you'll be charged the standard international rate (good). 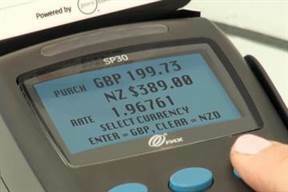 So, if you chose to pay in the local currency, then this means your home bank will be responsible for the currency conversion - this will be the best exchange rate and beat any "fixed" or "NZD" rate that appears on the screen. Several debit cards offer terrible value for money - not only do they charge a withdrawal fee of $5 or $6 AND a ~2.50% commission on foreign currency withdrawn from an ATM, they can charge PER USE if you tap or swipe them at merchants. This can be as high as NZ$6 - a total rip-off. For this reason alone, using a debit card overseas is a big no-no; credit cards (except at an ATM) and cash work best. If you do need to get cash out from an ATM use your debit card instead of your credit card and get a reasonable amount of money out to water down the $5 or $6 withdrawal fee. The NZD moves around a lot. If you are going overseas in the future but believe the current rates are good (and you have the money in your account and won't need it), lock it in by advance buying the currency you need. The advantage is your overseas money is sorted, the downside is that the rate could get better later on, and you have to be careful not to misplace the money. Not only will you pay a transaction charge and a commission, but you'll also pay interest from the second you place your hands on the cash. With cash withdrawal interest rates at around 20% to 25% p.a, you are charged from the moment you take the cash out of the machine. Even if you pay it back on your next bill, you will pay ~1.5% to ~2%​ on the total cash withdrawn. If you don't repay it, interest keeps being charged until you do. It's very easy to fall into the trap of frittering away leftover foreign currency at airports or on unnecessary items, unsure if and when you'll use it again. However, there is an alternative that is much better - both ASB and Kiwibank will buy back foreign currency at reasonable exchange rates and without a fee (coins are excluded). Do you have a currency exchange tip or something you'd like to share with us? We'd love to hear from you - contact our team with your experiences.